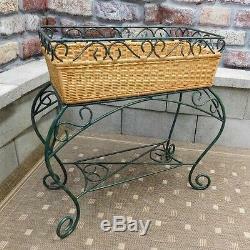 Iron & Wicker Plant Stand - PSC613A. This beautiful planter mixes the elegance of wrought iron with the class of wicker to create a piece that would brighten up any room. Available in a Natural finish. Dimensions: 28"W x 13.5"L x 28H. The item "Brand New Wrought Iron & Wicker Standing Planter" is in sale since Friday, January 20, 2017. This item is in the category "Home & Garden\Yard, Garden & Outdoor Living\Gardening Supplies\Plant Care, Soil & Accessories\Baskets, Pots & Window Boxes". The seller is "franswickerandrattan" and is located in Ledgewood, New Jersey. This item can be shipped to United States.